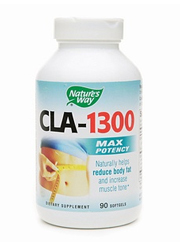 Nature's Way CLA-1300 Review (UPDATED 2019): Is It Safe? Nature’s Way CLA-1300 Review: Is It Safe? What is Nature’s Way CLA-1300? Featuring one patented ingredient that is said to eliminate fat in a potent and maximized way. They claim their product can increase the tone of muscle and that it is an all natural formula, free of any stimulants. There’s a nifty site map that shows all the local areas near your zip code that sell this brand. They also feature a woman’s flat stomach on their bottle logo though it appears this product is intended for males as well. So far there’s a lot of potential positives but how does it hold up? Let’s take all the evidence and see what comes up. The manufacturer Nature’s Way has sold herbal supplements for years now. Unfortunately they have come under recent scrutiny by the FDA. Apparently they made grand claims that their products could cure illnesses and disease which cannot be stated without evidence. They’ve also are being investigated over testing on their brands that failed to include ingredients they mentioned would be included. Another FDA inquiry left a warning letter to the makers for having unstated amounts of the drug Lovastatin. As of now it remains uncertain if Nature’s Way has accurate amounts of ingredients or if tampering is involved. Nature’s Way does not give a complete feature on their products key ingredient but the company that patented this ingredient offer more insight. Apparently after taking this product that can only be found in foods, body fat is lost and lean muscle is gained. This has been shown in one of the company’s trials which spanned between 8 to 12 weeks. While this trial sounds promising since the manufacturers ran tests the results may be skewed. They do say that the LCL enzyme which gives more fat to cells is blocked off which in turn reduces fat storage . Also fat is lost thru the addition of the CLA which rids the body of stored fat. When combining exercise further fat cells are lost because of their transportation to the muscles as opposed to sticking to the body. Customers however offer less support for this. People mention the pills are massive and due to the oils of the pill it can leave a terrible residue in the throat. Even more troubling is some people have reported significant weight gain. Clarinol CLA(sourced from safflower seed oil featuring 80% conjugated linoleic acid): Found in many meats and dairy products, this oil is supposed to regulate insulin and increase body weight change. It’s important to note this brand is high in trans-10 and cis-12 which can lead to type 2 diabetes and heart problems. Potential Side Effects:Indigestion, diarrhea, gas, fatigue, and heart disease. A friendly map shows all the retail stores that sell this product. While this product seems wholesome at first glance there are many issues that remain. There’s cause for concern when you account that the product itself is of an unknown quality. It cannot be understated when the FDA has intervened countless times because of this companies lack of oversight. They’ve had untested amounts of drugs inside their products, completely omitting ingredients and inaccurately claimed healing was possible thru their products. To add to the issues this product is high in two ingredients that may cause an increased risk for diabetes and heart disease. This product uses a patented ingredient and only offers a few inactive ingredients that help preserve quality. It’s unknown what difference their brand has over the original company that patented this supplement. Another problem with this company is that they have a count button of how many people have recommended this. It has an impressive amount of people liking it but upon inspection all it takes is a click to add to it. No one has left any actual testimonials and the people who liked it may have been tricked into thinking they could read testimonials. Major concerns have tainted this product’s usefulness. The potential risk of not having accurate amounts or even any of the ingredient listed is a major concern. Couple that with the ingredient having a potential risk to the heart. It still remains to be seen if this product has any use as some customers remain unsatisfied. Having to worry about a product’s safety should not be a tolerated standard for weight loss brands. Cast the doubt aside and make the choice to lose weight in a safe and trusted brand. By making the right choice you allow yourself peace of mind and an introduction to a new self. All natural products are in place to help you reach your weight loss ambitions. Whats better than Nature’s Way CLA-1300?